Ioane Ukeke at the Orpheum, 1902. 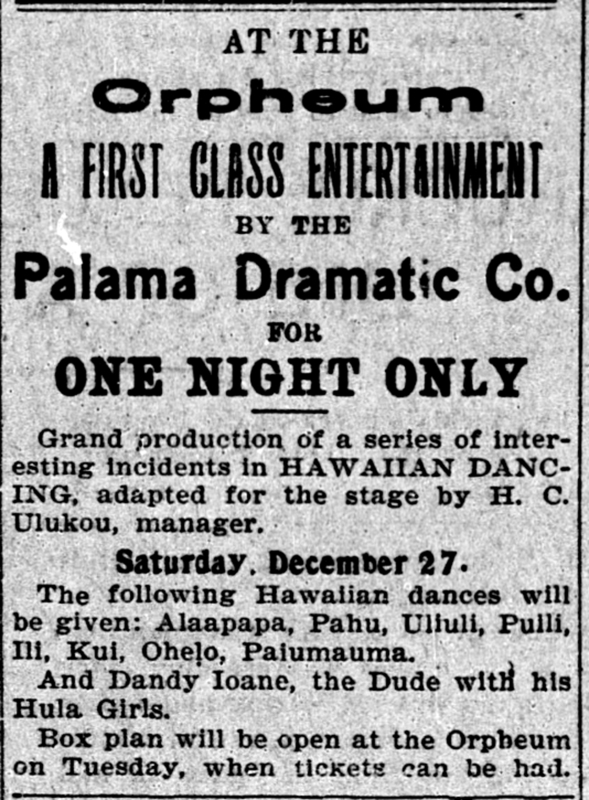 Grand production of a series of interesting incidents in HAWAIIAN DANCING, adapted for the stage by H. C. Ulukou, manager. The following Hawaiian dances will be given: Alaapapa, Pahu, Uliuli, Puili, Ili, Kui, Ohelo, Paiumauma. And Dandy Ioane, the Dude with his Hula Girls. Box plan will be open at the Orpheum on Tuesday, when tickets can be had. The Pacific Commercial Advertiser, Volume XXXV, Number 6359, Page 10. December 24, 1902. Hula, mele, and tradition, 1928. There are some people here trying to find once more the hula, chants, and songs of old Hawaii. Some people believe that it would be good to perpetuate the hula and olioli hoaeae of the the old. Some believe strongly that it is a waste of time or that type of endeavor would be old fashioned [olopaikini]. SATURDAY NIGHT, THE 26TH OF THIS MONTH! There will be some Mele performed with Native Hawaiian instruments, and some with Haole instrments. 1. IPU PERFORMANCE [LEALEA PAIPU]—4 girls whose steps are like flashes of lightning. 2. CHEST SLAPPING PERFORMANCE [LEALEA PA-I-UMAUMA]—3 boys with swift hand motions. 3. MODERN PERFORMANCE [LEALEA HOU LOA]—4 dolls. The dolls will do a Hula Olapa, and their hand motions will be like those of a human. 4. UKEKE PERFORMANCE [LEALEA UKEKE]—Mr. John Ioane will show his total skill with the metal ukeke (Jew’s harp) with Hawaiian songs and Haole songs—He will exert himself with his ukeke playing in all fashions—[It doesn’t help that the image is not clear, but cannot make out the next line and a half. Anyone?] and your hearts will be captured. 5. ULIULI PERFORMANCE [LEALEA ULIULI]—2young children. They will show the fluttering and rattling of this thing, the Uliuli. 7. ACCORDIAN PERFORMANCE [LEALEA KOLIANA]—Henere [Henry] will show his skill at playing the Accordian, and the sounds he makes: Chinese, hoaeae, oli and the musical scale [pakoli]; it will make the crowd laugh and your sides will hurt. 8. OHELO PERFORMANCE [LEALEA OHELO]—2 women. They will show their abilities at this amusement. This is the amusement of the alii of the olden days that they greatly enjoyed. 9. KUI PERFORMANCE [LEALEA KUI]—2 women. These two ladies will display their readiness at this amusement while from their mouths come mele. 10. UKEKE PERFORMANCE [LEALEA UKEKE]—Mr. John Ioane will show his playing of the ukeke with Mele of the King; and this sweet voice of the ukeke will be accompanied by the steps of some girls doing lele this way and that. 11. MODERN PERFORMANCE [LEALEA ANO HOU]—The Famous Mr. Ioane will show once again some new things that will have the audience in stitches. The doors will open at 7 P. M. Performances begin at 8. ENTRANCE FEE: $1.00, $ .50. Tickets [Balota ?] available from hand of those in charge as well as at the entrance. Ko Hawaii Pae Aina, Buke III, Helu 26, Aoao 2. Iune 26, 1880. 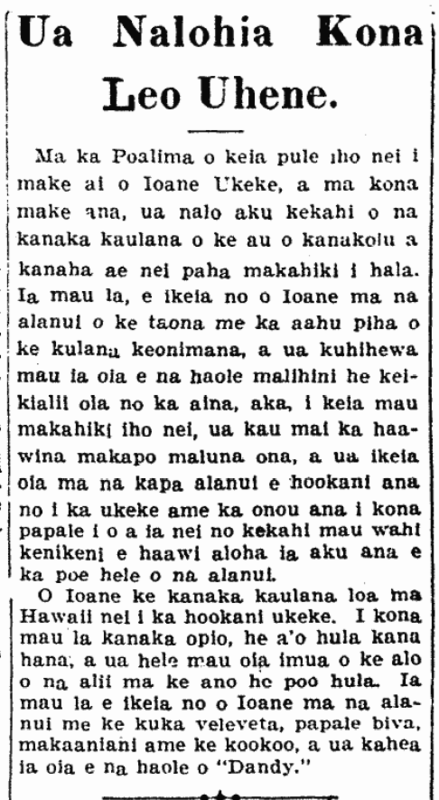 One more on the passing of Ioane Ukeke, 1903. Last Friday, Ioane Ukeke left this life, he was one of the old-time kamaaina of the Kukalahale Rain [famous rain of Honolulu], and he was a skilled expert at teaching hula and playing the ukeke in the days gone by, and it is because of Ioane’s skill at playing the ukeke that he received the nickname “Ioane Ukeke.” During the reign of King Kalakaua, he was a hula teacher [kumuao hula] in the royal court, but what made him famous was his showing off in costume, and there was many a time when foreigners mistook him for a prince when he passed by the street corner [huna alanui? huina alanui?] in his stylish attire and his silk waist [pakana ?] and velvet slacks with his beaver hat and monocle, with his short cane. Those proud days of Ioane have gone with the flow of time. He faced difficulties in his latter days, because of blindness. He was always seen on Fort Street with his favorite ukeke serenading those passing by before him, and those who felt aloha for this blind man would undo the tie of aloha and gave a helping hand to the impaired one. Aloha for him. Ke Aloha Aina, Buke IX, Helu 19, Aoao 6. Mei 9, 1903. Famed Dandy, Ioane Ukeke, is no more. 1903. His Joyous Voice is Gone. On Friday of this past week [5/1/1903], Ioane Ukeke died, and with his death, so too has one of the famous people of thirty or forty years ago left. Those days, Ioane was seen on the streets of town in full attire of a gentleman, and he was often mistaken by the foreign haole, as a prince of the land; but these past years, he went blind, and he was seen on the street sides playing the ukeke and sticking out his hat this way and that for some coins given charitably by the passersby. Ioane is very famous in Hawaii for his playing of the ukeke. In his youth, he was a hula teacher [a’o hula], and he often went before the court of the alii as a hula leader [poo hula ?]. In those days, Ioane was seen on the streets in a velvet suit, beaver hat, glasses and a cane; he was called “Dandy” by the haole. Ka Nupepa Kuokoa, Buke XLI, Helu 19, Aoao 6. Mei 8, 1903.